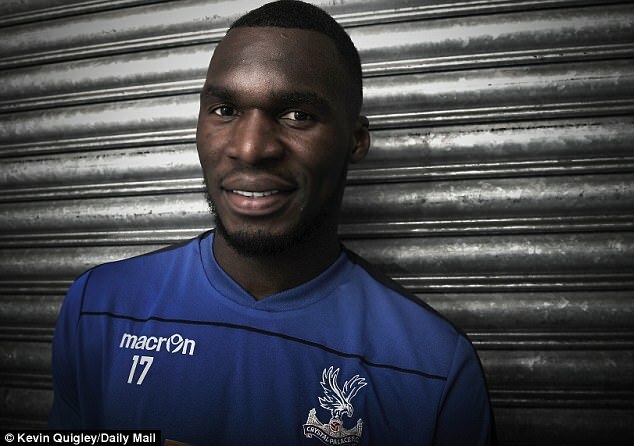 In 1994, when Christian Benteke was three years old, his parents fled their native Zaire to escape the dangers of military dictatorship. The family settled in Belgium as refugees, so for young ‘Chris’ it was not the easiest start to life. 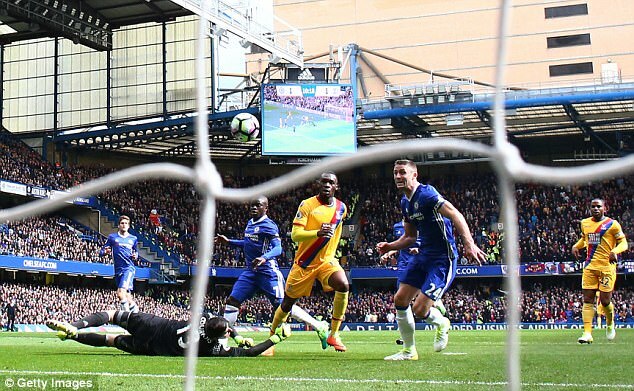 We should not be surprised, then, that the Crystal Palace striker, now 26, does not get too upset about much of the faux melodrama that surrounds the Premier League. He cares deeply about the football but less so about the noise. This, for example, is his take on the fuss that followed his recent two goals against his old club Liverpool at Anfield. 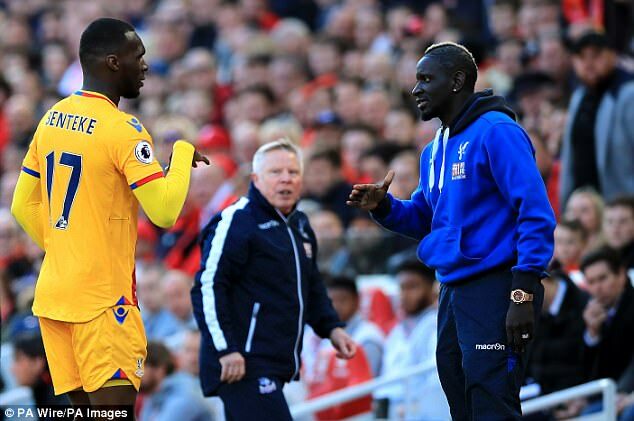 According to today’s peculiar take on the idea of loyalty, Benteke and team-mate Mamadou Sakho — himself at Palace on loan from Liverpool — should not have celebrated together. Their crime? A choreographed handshake. 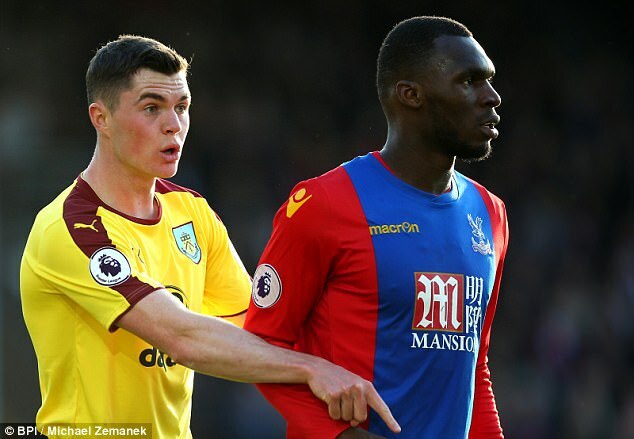 ‘I think it was quite harsh and wrong to criticise him,’ said Benteke, aware that the brunt of the opprobrium has been aimed at his friend. ‘I told him that if I scored I was coming to him so I went to him. ‘He didn’t do anything wrong. Imagine if he had just sat there and said: ‘No, Chris. Don’t come to me’. I would have been the one angry at him. 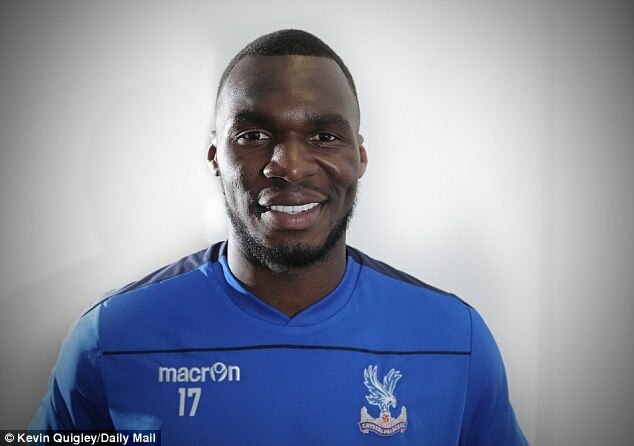 Benteke has been respectful about his difficult time at Liverpool since leaving for Palace last summer. When we met this week in London, he stressed that he wished that to continue. ‘I don’t like that talk,’ he said, wincing. ‘It’s the past so it’s hard for Liverpool to say: ‘We miss him just because he scored two goals against us’. 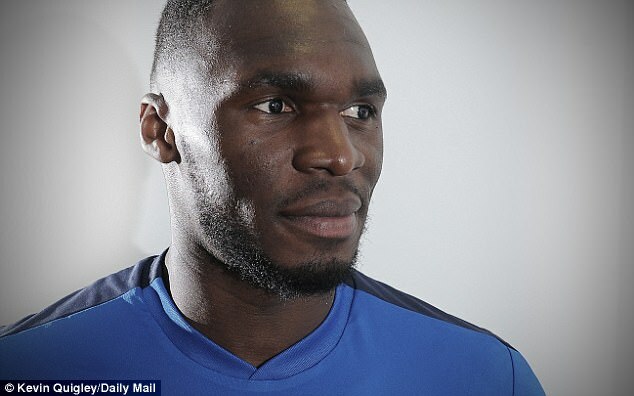 Benteke has more pressing matters on his mind this weekend than those concerning his old club. 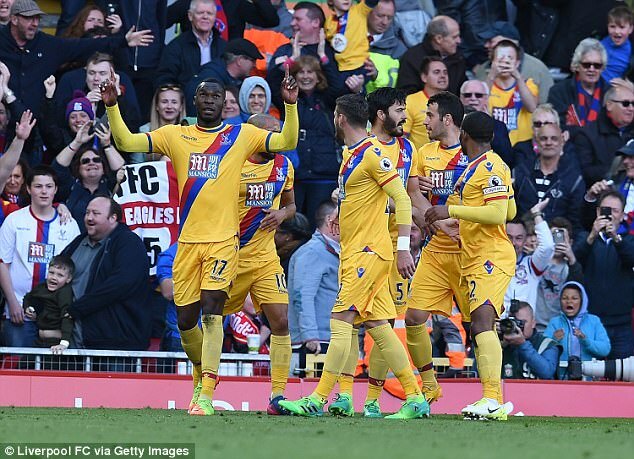 We all presumed Palace’s defeat of Liverpool a fortnight ago had ended their participation in the relegation battle. We were wrong. Since then Palace have lost at home to Tottenham and then Burnley. 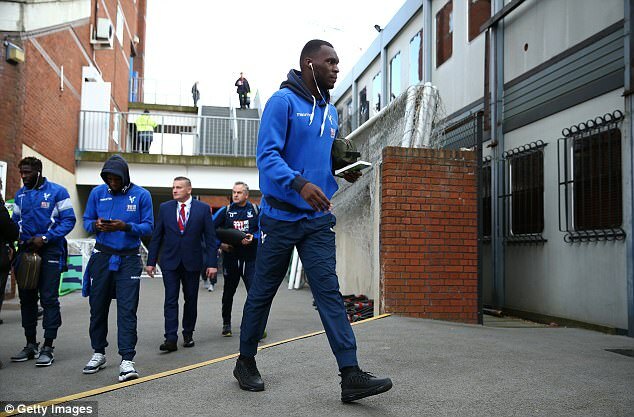 On Saturday lunchtime, they are at Manchester City and Benteke must hope his team can find something of the form that also saw Sam Allardyce’s team win at Chelsea in recent weeks. ‘We have put ourselves under pressure again after what we have been through,’ he said. ‘So let’s try to finish well and be safe. Consistency is the hardest thing for a football player to get. I don’t think you can tell me a lot of players [in England] this year that have been consistent. ‘That’s why you can see the difference between players like us and Gerrard, Lampard and Drogba. They have been consistent for years and not only for one season. That’s that bar we want to reach. ‘We have to go to City and do the same things as we did at Liverpool and Chelsea. Nothing is impossible so we have to try. ‘Remember, what happened against Liverpool wasn’t an accident. You ask if it was special to score against them and, yeah, that’s right. It was. But I wasn’t surprised because I am a believer. It’s not luck. 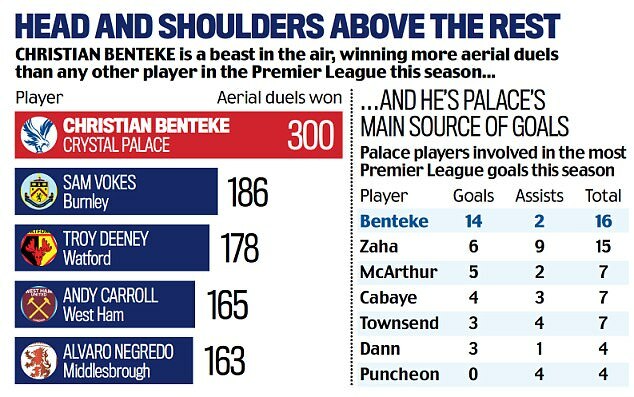 These days it is central defenders who worry about Christian Benteke, the scorer of 16 goals in his first Palace season. As a kid scoring freely in Belgian youth football, it was parents asking all the questions. ‘I was tall but skinny back then,’ he smiled. ‘I used to bring my ID to matches as some other parents were complaining about my size. They thought I was too old to play, older than I said. So I had to bring proof. ‘It was between the ages of 12 and 15. I scored many goals, mainly because I was taller than everybody else. I didn’t realise or think I had anything special. Growing up in Liege, he played his first serious football for a small club — JS Pierreuse — founded by a local priest. The aim was simply to give poor children a route off the streets and into the game. 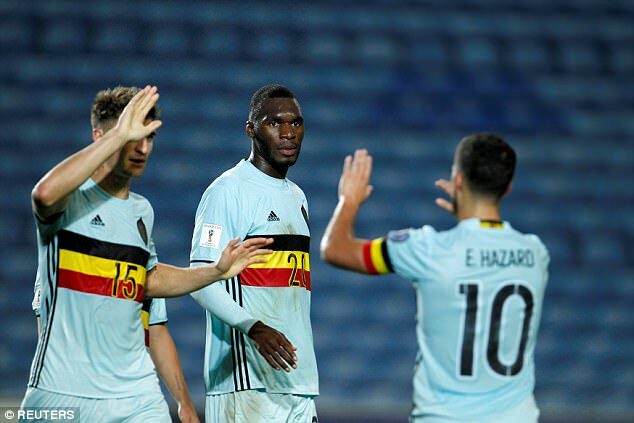 Benteke’s talents were obvious to those who watched him but at times his father Jean-Pierre refused to see. When Chris flunked his fourth year at primary school, his father cut up his football boots with a knife. A military man when in Zaire, Jean-Pierre would have preferred his son to concentrate on education. 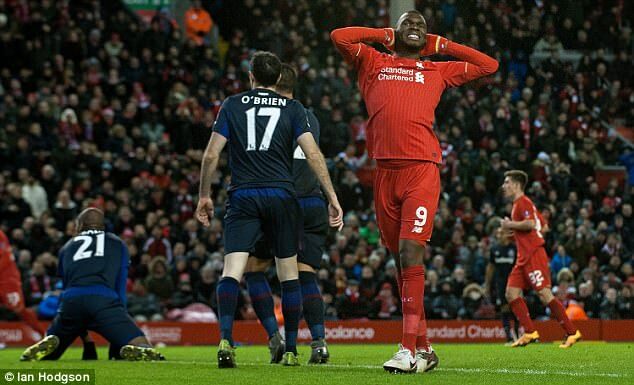 The two men are close to this day but Benteke still recognises the quiet reserve. ‘I finished my school years and my father realised I wasn’t going to carry on,’ he explained. ‘I just wanted football and he was OK with it by then. My dad is a strong man and he won’t say much. ‘He will say: ‘good game’ or ‘bad game’ but he will never say ‘I am so proud of my son…you are the best player in the world…blah, blah, blah’. That is partly why I am so focused and I hope humble and, yes, I think it’s because of his [military] background. ‘He hasn’t come to watch me in England. Well, twice he came. He came once at Villa in 2012 and once when I was here. Never at Liverpool. He feels like he is disturbing me when I am playing, if he is there. He knows I want to focus. At Liverpool he was upset and worried, though, because he knows I could have done better. I know he cares and I know all he has done for me. 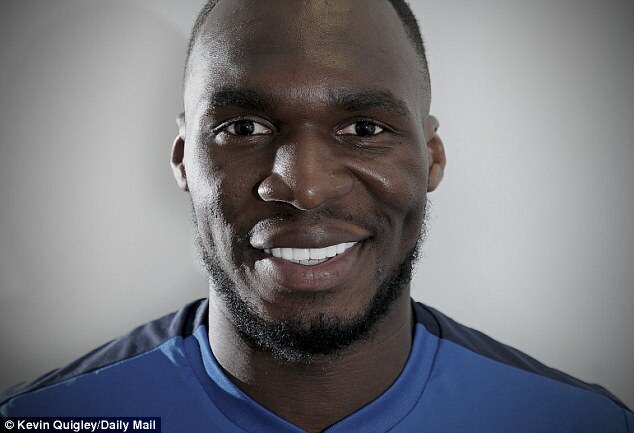 From Genk in Belgium, Benteke arrived in the Premier League with Aston Villa in August 2012. His output was impressive as he scored 42 goals in 82 league starts over three seasons. It was not a surprise when Brendan Rodgers signed him for Liverpool for £32.5m in the summer of 2015. Liverpool, as we know, was harder for him, especially when Rodgers was replaced by Jurgen Klopp two months into that season. Klopp wanted one type of centre forward and Benteke wasn’t it. 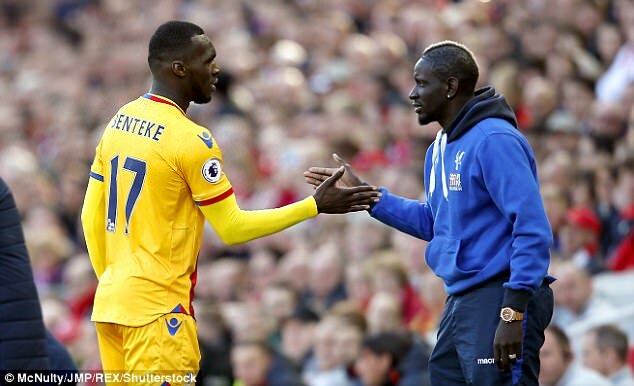 The two didn’t speak at the recent Anfield game but Benteke reveals there was a handshake and he is not one to talk about regrets, anyway. Not when he has come this far. An Arsenal fan as a boy, he used a visit to an aunt in Tottenham as an excuse to hang about outside Highbury. 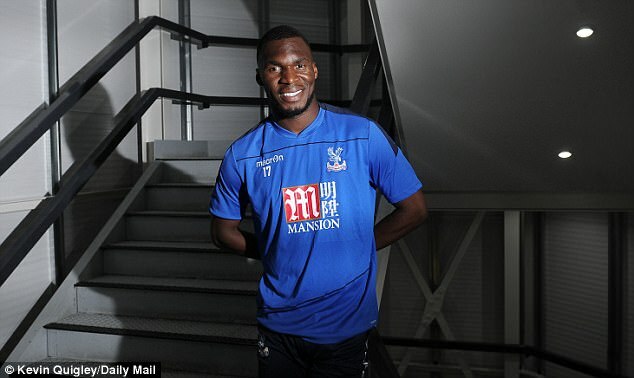 Christian Benteke’s introduction to Sam Allardyce was not the best. 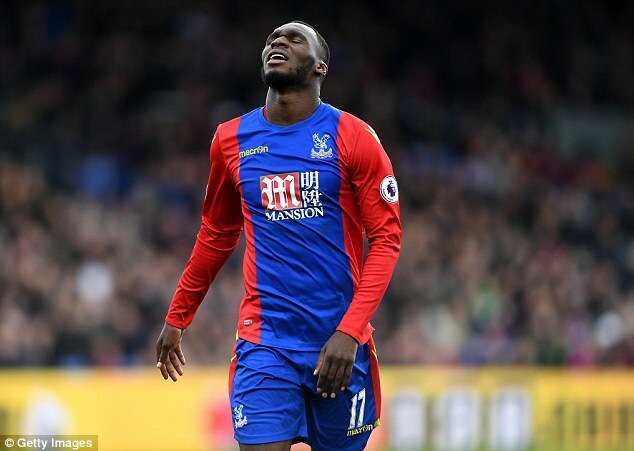 Palace were leading 1-0 at Watford during the new manager’s first game on Boxing Day when Benteke fluffed a penalty via one of those stuttered run-ups. 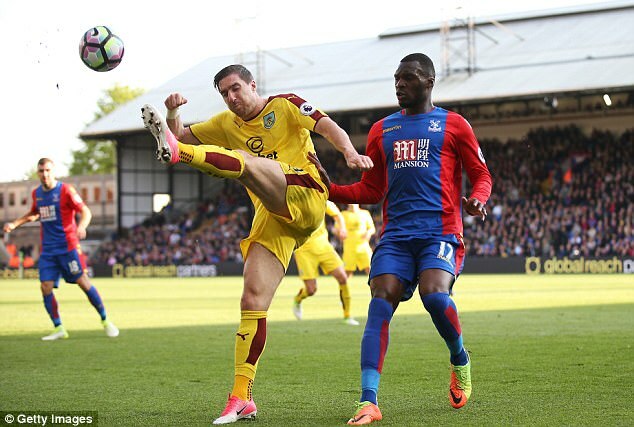 The game finished 1-1 and Palace were not to win in the league under their new boss for another month. I had to bring ID to matches as parents moaned about my size! 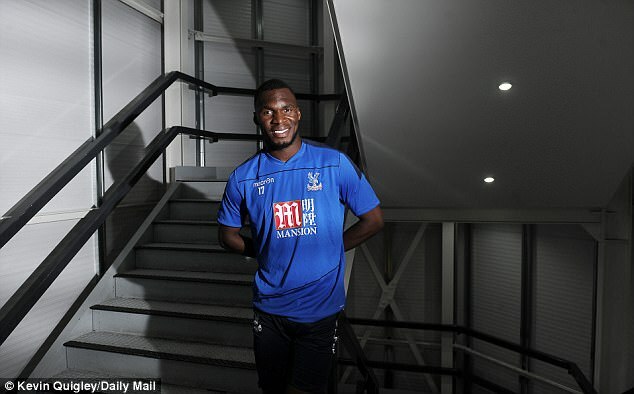 Palace, according to Benteke, have improved under Allardyce on the back of better physical and mental fitness. The striker was criticised for his defending in a kamikaze 5-4 defeat at Swansea last November, a game that did little for the survival chances of manager Alan Pardew, sacked soon after. 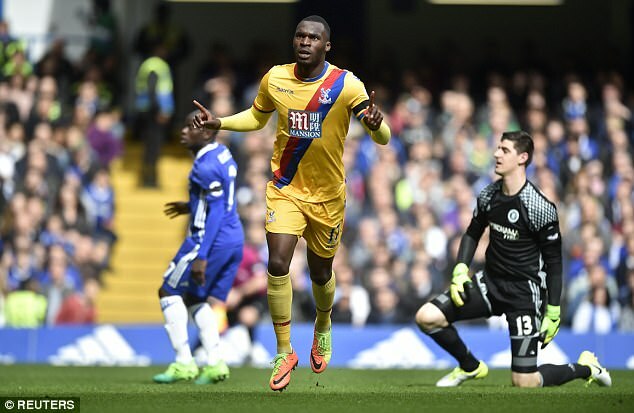 ‘I felt we couldn’t hold on to a result for 90-95 minutes before,’ Benteke said. ‘Maybe because of the work we were doing on the training ground. Since Sam has come it’s much better. We are harder to play against. ‘I remember some of the games where it was mentally and physically [not right]. I know I was criticised after Swansea and it’s not that I don’t care, I just know how hard it is to defend in this league. 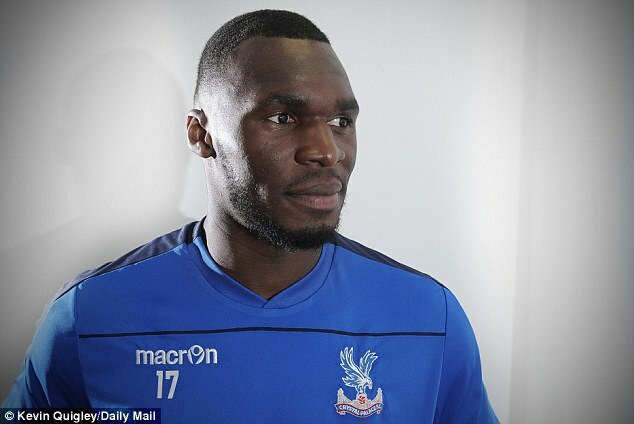 Settled in Wimbledon with his wife Fortune and their two children Jaden and Nylah, Benteke sees a future in London and in the Premier League. His stated aim is simple. ‘Consistency,’ he said. He knows footballers will always be criticised and it’s something unlikely to keep him awake at night. Especially now that he has ended the debate in his own home. ‘As a striker if you don’t score then you go home and you are not happy. You don’t want to talk. You just want to be inside and to forget.